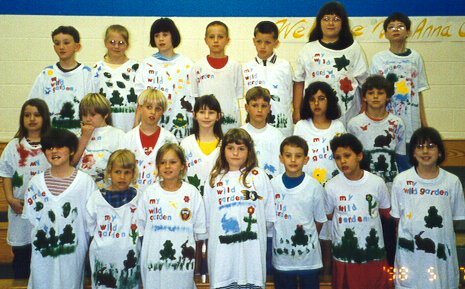 The children in Blairsville, Pennsylvania read my books and came up with some fun activities for my visit to their school in May, 1998. If you have an idea for an activity using one of my books that you'd like to share with others, let me know and I'll pass it along, too. Jane Kokolis' second graders combined a reading of Miss Emma's Wild Garden with their science unit on plants and created wild gardens of their own, as well as the T-shirts pictured and described below. 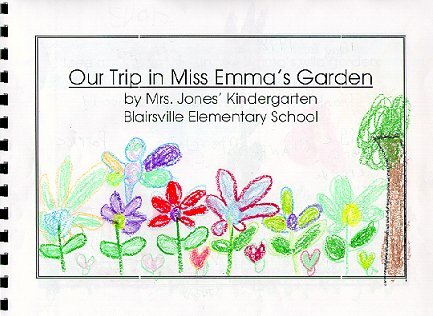 Miss Jones' Kindergarten class prepared a class book about Miss Emma's garden which is also pictured below. My thanks to both of these creative teachers and their classes for sharing their work with me and allowing me to share it with others. I am Jane Kokolis, and I teach second grade at Blairsville Elementary School in Blairsville, PA.
My class used acrylic paints and templates made using a die cutter to decorate our shirts. The children used Inscribe's Print and Paint Sponge letters to print " my wild garden" on their t-shirts. With the help of two wonderful mothers, we were able to complete the shirts in about an hour. My school e-mail address for anyone with comments or questions is: <kokolisj@iu28.arin.k12.pa.us>. Above is the cover of Miss Jones' Kindergarten class book. Inside the book each child has created a page using the template shown to the right. For a full size page, click on the template, then select the print icon on your browser to print out your own copy.